*This chart reflects the features from the CFA Level 1 online course offerings from each company. Unlimited Access: You have unlimited access to Wiley CFA course materials. Not only do you have access to the course until you pass, all online content updates and software upgrades are free. These are great features for a CFA course; most other companies are not so generous and access typically ends on exam day. Bite-Sized Lessons: Wiley knows that there is a ton of material to cover for the CFA® Exam, which is why this course is organized into clear and concise lessons. Shorter lessons allow you to stay engaged, retain more information for a longer period of time, and better monitor your progress. Exam Planner: If you are worried about how to cover all of the course material in time, don’t be! Wiley’s Exam Planner allows you to enter the date of your exam and will provide you with a customized study plan so you’ll know what to study each day until the test. Mobile Device Friendly: This course is optimized for tablet use and allows you to study from a smartphone or other mobile device. Lessons on your devices are synchronized, so you can pick up wherever you left off from any device. Nothing beats the convenience of studying at home, at work, or while you are commuting to get in those crucial 300 study hours. Quality Material: Wiley’s continuous content updates mean that you are always getting the most recent, relevant content for the CFA Level 1 Exam. Top-notch lectures by experienced instructors, excellent written guides, and the inclusion of every Learning Outcome Statement (LOS) in the CFA® exam curriculum make this one of the most comprehensive courses on the market. Bite-Sized Video Lectures: The instructors short and to-the-point video lectures only average about 10 minutes each! You’ll have access to 40+ hours of instruction per level that have been broken down into more manageable chunks of time so you can learn and retain information more efficiently. Topic Mastery Feedback: Our Topic Mastery report provides feedback assessing your preparation for your next CFA Level I exam. Topic Mastery serves as a guide to your preparation. We encourage candidates to dedicate more time to topics that need more improvement. With Topic Mastery, you can study more efficiently. Fast Loading Speed: Adapt Prep has worked hard to make the their course software and videos load faster in terms of response time. They’ve added additional databases and servers to ensure that you won’t be bogged down due to video buffering or lag time. As we tested out their course we were amazed at how quickly the software performs. Affordable Price: AdaptPrep CFA is the best bang for your buck prep course on the market. Their Complete course package costs less than half as much as the industry average making them the most affordable comprehensive CFA study materials you will find anywhere. Extensive Question Bank: Apptuto gives you access to 3,000+ questions and detailed explanations. All questions are written by CFA qualification holders. Their unique Similar Question Generator allows you to work on exactly those questions you need to practice the most. Number of Customizable Practice Tests: Create as many practice tests as you want with questions chosen from specific readings, by question-type or difficulty level and then decide how they should be weighted on your practice exam. Check your performance on tests on the course dashboard while you track your progress in the course and see how you measure up against your peers. Advanced Course Analytics: The course dashboard provides detailed feedback on your performance. Check your overall proficiency, progress points, leaderboard ranking, your medals or achievements, the number of questions you’ve attempted, and the percentage of questions you’ve answered correctly, all from one central location. Performance Graphs also chart your weekly test scores. Live-Online Courses: Apptuto now offers Live-Online courses for CFA Level 1 and II exams and plan to release Level 3 in early 2017. Their Premium Course offers 54 hours of live-online CFA classes over an 18 week period and includes 1 on 1 coaching with the instructor as well as a 100% Pass Guarantee. You also have the option to take the Intense course which includes over 100 hours of live instruction. 1 on 1 Support: With the Coaching package, you will have 5 hours with a personal tutor that can assist with your study plan and other aspects of learning. Even if you don’t opt for the 1 on 1 coaching, there is an online community forum for you to ask questions and find answers. Top-Rated Instructors: The instructors with this course are top-rated and extremely knowledgeable. Because of this expertise, everything you’re going to learn is in line with the latest tips and tricks that are available to anyone studying for the CFA. The tutoring services that Bloomberg provides are what puts this course over the top, as it’s something that many other companies do not offer. 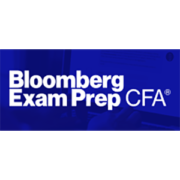 Two-Week Trial: While some test prep companies pat themselves on the back for a one-week trial, or even just three days, Bloomberg CFA grants you two-week access to their course. This is an exceptionally long trial period, as you should be able to determine whether or not this content lines up with your learning type within that period. Adaptive Learning Technology: Bloomberg uses state-of-the-art technology to give you a great learning experience. After an initial assessment period, the course will figure out which of the areas are troubling you, and adjust your study plan accordingly. While other courses may have adjustment mechanisms, Bloomberg’s is among the best in this regard. Dashboard: Because Bloomberg has resources that aren’t available to many prep companies, its technology is above and beyond that of any of its competition. The dashboard in this CFA review course is unparalleled, as it comes with an aesthetically pleasing home page, great web design throughout, and easy-to-navigate headers and dropdown menus. Instructor Support: International faculty around the globe and 24/7 access to the help desk guarantees that you will receive prompt answers to your questions, regardless of time zone. Mentors also regularly check in with you to ask how the course is going. Money-Back Guarantee: Fitch Learning offers a 100% money back guarantee if you do not pass the exam after meeting certain milestones. Only CFA Level I students are eligible for the guarantee, so be sure to check out the full list of requirements on their website. Mobile App: A mobile app allows you to access key course features on the go. It is available in both the iTunes and Google Play stores. Course content can be searched and downloaded in advance for offline studying. This allows busy professionals to study for the CFA® exam anywhere they go from their smartphone or tablet, whenever they have a few minutes. Practice Tests: Kaplan Schweser offers 6 full practice exams and 4,000 practice questions that are very similar to those on the exam. Practice exams are great for gauging your progress and this course gives you numerous opportunities to put in a lot of practice before test day. Updated Content: This course is updated every year as the CFA continues to evolve, which means that course materials will closely match what you see on the exam. You won’t waste your time on material or questions that may not appear on this year’s exams. Instructor Support: Even with the Kaplan Schweser Self-Study package, you are not left to fend for yourself if you have questions about the material or need additional clarification. You can connect with a CFA instructor during specific office hours and receive guidance on more difficult concepts. Price: Premium packages cost upwards of $1,799, which is considerably more than other CFA courses on the market. If you are on a tight budget, Kaplan is not going to cut it, even though this course comes with some pretty cool study tools, like the live person support. Wiley vs. Kaplan CFA 과 Wiley vs. Fitch CFA. For information on why you should become a CFA, click here.